Go to Walmart and get it. Put it in the oven on 2 for 2 minutes. Get it out. Eat it. Buy it at Walmart. Put flour and flavor on it. Cook it in the oven on 4 for 4 minutes. Eat it. Get a turkey at the Dollar Store. Color it red and black. Wash it. Put it in the oven for 2 minutes. Take it out and eat it. Go to Walmart and get a turkey. Cook it on the stove on low for four seconds. Bring it to mom and put it in the freezer and save it for another day. Get a turkey at K-mart. Cook it in the microwave on high for 6 minutes. Eat it. Get a turkey at Walmart. Kill it. Cook it in the oven on 1 for 21 minutes. Eat it. Go to Walmart and get a turkey. Take it home. Cook it in the microwave on high for 2 minutes. Eat it. Get the turkey at Kroger’s. Put him in a pot. Cook him in the microwave on low for 2 minutes. Eat him. Go to Walmart and buy it. Bring it to school. I’m gonna bake it in the cafeteria. Put it in the microwave on medium for 8 hours. Put some chicken on it. Eat it. Get it in the woods. Hunt it down. Put it in the oven on 10 for 2 minutes. Go to a farm and catch a turkey. Pick off all the feathers. Put him in the the middle of the oven and cook him on 60 for 40 minutes. Eat him. Go to a farm. 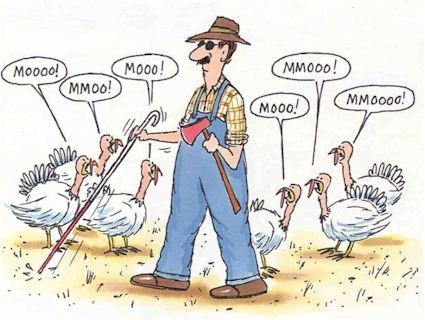 Catch a turkey. Bring him home. Let him go in the grass. Eat chicken. Go in the woods. Shoot him with a gun. Skin him. Bring him home. Put him in a pot. Bake him on 12 for 13 minutes. Eat him. Try asking your children about Thanksgiving turkey and see what they say…. I really had to wonder about the kid who was going to take his walmart turkey to school to cook it in the cafeteria microwave– wow! I’m guessing most of these kids pretty much only eat microwaved, prepackaged food. Definitely a sad theme here.